Lying in the northwest foothills of Attika's mountain Hymettus, approximately 8 kilometers from the center of Athens, Papagou - Holargos municipality covers a region of 10.34 square kilometers with a population of 44.539 citizens (2011 census). 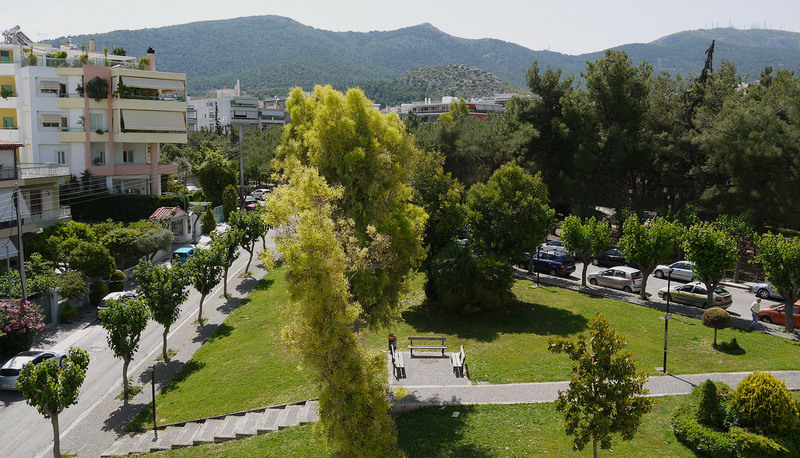 Its immediate proximity to Hymettus mountain accounts for its good weather and pollution-free climate, its panoramic view of the city of Athens and its green scenery, amplified by a vast amount of public parks throughout the city. The Municipality was formed in 2011 at the local government reform by the merge of two former municipalities, the Municipality of Papagou and the Municipality of Holargos, that became its municipal units. Holargos was founded in 1926 by “Agropolis C.O.”, a construction association that implemented a novel town planning emphasizing in ample public space and green areas. The name of Holargos was chosen to honor Pericles, the most prominent and influential Greek statesman, orator and general of Athens during the “Golden Age” – sometimes known as “Age of Pericles” – who was born in 495 BC in the ancient municipality of Holargos. Papagou was founded in 1950 by “AOOA”, a construction association allotted to build houses for the families of Greek military officials that offered their services to the country. The name comes from Alexander Papagos, the famous Greek Field Marshal who led the Hellenic Army in World War II, excelled in the Greek-Italian War in 1940 and was elected Prime Minister of Greece in 1952. The citizens of Papagou-Holargos, mainly middle to upper class, hold a record-percentage in higher third-level education - 45% of the population hold a university degree, while 10% have attended postgraduate studies. Papagou – Holargos is a mainly residential area with commercial businesses allowed only within designated zones. Public municipal facilities include a variety of culture and sports centers, spread out within the city. Suited in the center of Attika’s Research & Educational Pole, the municipality lies within a 2 kilometer distance from a large number of research and educational facilities, hospitals, ministries and other government buildings. Its immediate proximity to Mesogeion Avenue and Attika Road, allows for an effective transportation system via car, bus or metro, connecting the city with Athens, Piraeus, the Eleftherios Venizelos airport and the Attika harbors. reflects its main development priorities that apply to the environmental and cultural aspects of the urban life, following a "smart" high-value-added agenda.